The words “get it done” have taken on new meaning for Spencer Beach. They were among the last instructions he received from his employer on April 24, 2003, at a routine job site in Edmonton’s Rutherford Close neighbourhood. Beach, a floor-layer by trade, was there to replace a linoleum floor because the homeowner didn’t like the colour of the original. It was a job he had performed many times and he knew the risks well, especially those involved with using a highly toxic solvent called Roberts 1901, used to dissolve the adhesive that held the linoleum to the subflooring. Once inside the home, Spencer Beach began, as he always did, by turning down the furnace and opening the doors and windows for ventilation. Although he should have been wearing leather gloves to protect his hands, he opted to leave the gloves under the seat of his car because they left his hands hot and sweaty, making it difficult to manipulate his tools. For the next few hours, he focused on the task at hand. Every so often the wind would shut one of the doors and he’d have to stop what he was doing, get up and open it again. Anxious to finish work for the day, Beach looked forward to planning a stag party for a good friend later that night. With only 12 square feet of flooring near the home’s front entrance to finish before calling it a day, Spencer Beach closed the front door. At the same time he heard the door to the garage – which he had opened earlier that day – blow shut. Knowing he would be finished in the next 15 minutes or so, he decided that it wasn’t worth worrying about. He was wrong. Seconds later, he was immediately surrounded by flames after hearing a heard a loud explosion. He reached for the door handle in front of him, but the fire had created a vacuum inside the house and the door wouldn’t budge. Blinded by the scorching heat, Beach ran down the hallway toward the laundry room and eventually found the door to the garage. It wouldn’t budge, either. By now, he could smell his hair and clothes burning and feel the skin on his face tightening around his bones. He ran back to the front door and pulled desperately on it, but it still wouldn’t open. The fire raging inside the house was now at 1,500 degrees and Beach could feel his skin bubbling from the heat. No more than 20 seconds had passed since the explosion. Beach, unable to get either of the doors to open, curled into a ball on the floor and prepared for death. He distinctly remembers a feeling of peace and a sense that time was slowing down. But he also remembers thinking of his wife, Tina, who was four months pregnant, and the burden that his death would place on his family. And so, one last time, he reached for the now red-hot door handle and pulled with everything he had. This time it opened, and Beach fell several feet into a pile of highly flammable construction garbage, including the linoleum flooring he had just removed. Now completely engulfed in flames, he stood up and ran down the driveway. Two-thirds of the way down it, he collapsed. A man standing at the end of the driveway turned his garden hose on Spencer, and a woman, a nurse, knelt beside him and told him an ambulance was on its way. Beach told the nurse to contact his pregnant wife and make her aware of the accident. He could smell charred flesh. His lips felt swollen and strange. He wondered about his fingers, his toes and his ears. “My life is over,” he remembers thinking to himself. For the next six weeks, Beach remained in a medically induced coma at the Firefighters Burn Treatment Unit at the University of Alberta Hospital. After that, he had to overcome months of surgeries, an addiction to painkillers and an overwhelming feeling of depression. The doctors stapled 90 per cent of his body with Cadaver skin. Only the skin on his groin, knees and the bottom of his feet survived the fire. Spencer Beach has reinvented himself as a motivational speaker, working to encourage employees and employers to operate safely. He believes that the provincial legislation identifies all strategic and education knowledge for employers. The challenge, he says, is getting employers – all of them – to truly take the issue of workplace safety seriously. Spencer Beach has presented to multiple organizations in North America. His story is one that audience members never forget. Beach’s storytelling ability draws audience members into his personal struggles along his journey. His presentations are straight from the heart, and he does not leave any truth uncovered in his story of recovery and survival. "Get it Done Safely" has a profound effect on everyone who experiences it! I use the story of my injury to show how I could have embraced safety and prevented my incident's harmful effects on my family and friends. I show the audience how they could suffer the same kind of pain, suffering, loss and disabling effects from simple mistakes, and how easily it is to avoid such hardship by embracing safety. "Get it Done Safely" is finely tailored to improve the use, understanding and importance of any organization's safety system, the safety culture at work and the individual's role in safety at home. This presentation will have an immediate and lasting impact on all levels of your organization. Love is arguably the best emotion we have. I believe anger is the second-best emotion. "Turning Your Demons Into Diamonds" is based on my personal struggles and triumphs, and provides a step-by-step plan to turn the negative effects of anger into something extremely positive and motivating. This presentation teaches that individuals can grow from hardship, and encourages the audience to leave the past behind while finding new hope for the future. I will finally answer why we all have hardship, where it comes from and what it is trying to do – the real reason hardship enters our lives. This presentation is structured for people facing all kinds of adversity in their lives: stress, disabilities, chronic pain, severe addictions, depression or any unwanted event. This presentation will never leave you, as Spencer's messages will be applicable throughout life. Gain a personal perspective of rehabilitation from a severe and life-altering injury. I reach health-care professionals from all types of nursing to a wide range of therapies. The presentation is designed to show the importance of forming bonds and using motivational techniques to improve the patient’s recovery. I will also explain why patients can have different attitudes while facing similar situations, helping the professional to aid in the emotional recovery of their patient. I recount my discovery of the "Healing Cycle," showing why clients have good and bad days, what they actually mean, and how to direct a client's recovery to a positive outcome. In this interactive presentation, I explain different types and severities of burns. As I address the most common demographic found in the burn unit – children – l teach not to fear fire but to respect it. My account of how I deal with the burns to my body and face helps build the childrens' self esteem and sense of purpose. I show the boys and girls what a "can-do" attitude really is, and encourage them to adopt such an attitude in their own lives. I give a tell-all presentation of my own experiences and decisions in middle and high school, leading up to my life-altering fire. The theme of this presentation is that teens are responsible for their own actions, and for the consequences of their decisions. I speak candidly about drugs and alcohol and how the use and abuse of these substances was not only the greatest mistake of my life but also changed a straight-A student into a tradesman – which ultimately led to me being burned at work. I tell my story to emphasize the importance of safety and to explain how safety will preserve the students' lives. I offer tools to deal with anger and hardship, and to build self esteem, and I explain how I found my purpose. Want something different and unique! Spencer can create a Keynote presentation suited just for your needs. In all of his Keynote addresses he will incorporate and utilize the conference theme, build excitement for the sessions, workshops and events of the conference while encouraging the delegates to return the next year. Topics Spencer can present on included Safety Awareness, Health Care, Self-Esteem, Drug and Alcohol use/abuse, Overcoming Hardship, The Power of Change and many more. 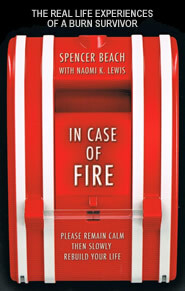 Beautifully written and told with breathtaking honesty, Spencer Beach's journey will astound and inspire you. At age 29, with his life finally falling into place and a new baby on the way, Spencer experienced a nightmare beyond imagination. But it is what he did with that nightmare that makes his story so compelling. Read it and learn what courage truly means. "In the months and years after the fire that disabled me, disfigured me, and almost killed me, I went through serious depression, excruciating therapy, and intense psychological counselling. I lived in pain and saw how I'd hurt everyone I cared about. I assessed and reassessed my attitudes and my life. Why did this happen to me? What did it mean? And, finally, how could I stop it from happening to anyone else? One psychologist told me I would never get over the trauma of the fire and its aftermath, but that I would find harmony with it. "This is the story of how I did that." "Saw your presentation Thursday afternoon at Darlington. I've told many of my friends about you & your story. Truly inspiring." "Had the opportunity to hear Spencer's story at Darlington Nuclear today. Thank-you for sharing your message of safety with us." "what an amazing story. Your strength and resilience are a lesson to all of us". "What an incredible Keynote. I have never heard a room full of people so hushed after a presentation. Thank you!"